Owen is a very affectionate child. He regularly hugs the parents of the other children at his daycare, is free and easy with his I love yous, and waxes amorous with almost everyone. He told me this morning that he loved me so much that he would never leave me, that he would live with us forever. Duncan and I laughed, told him he’d want to move out eventually, but he insisted, no. I love you too much to ever leave you. We’ll see about that. 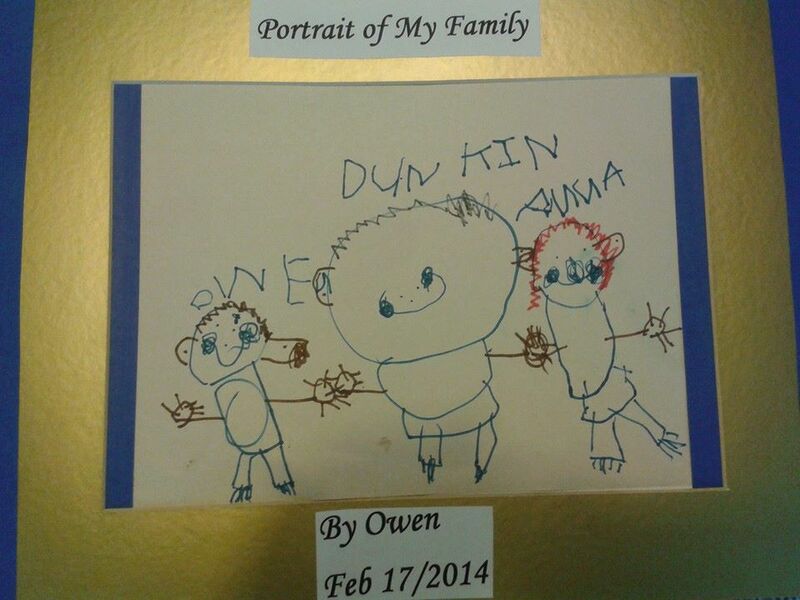 I am extra aware of these love-ins because one of the things Owen is supposed to “work on,” according to his daycare is his need for so much love. Please understand, I have the utmost respect for his teacher and I understand what she means — it just took me by surprise. I’ve heard this from his educators before, that when Owen is about to get in trouble, he will spurt forth an “I love you,” because he knows it to be an effective anger diffuser. He would do this to us a couple of months ago when he kept getting out of bed. He would wait at the top of the stairs, and when we would ask him why he was up, he would say, “I love you!” and then be led back to bed. His “I love you” was when he’d run out of other excuses, like he was worried there was a monster under his bed, or he was thirsty. And we’d be frustrated, because it was the third or fourth time we’d put him to bed, and we were tired, and it was late, and he was tired, and enough already – but it worked. We couldn’t (quite) get mad at a child who said “I love you” out of the darkness. On a very positive note, Owen has discovered how to write “I (heart) U” and is now writing that, and his name, and my name, on every surface. He has also started to draw kisses, which look like concentric circles. See below – the person with the really big lips? That’s Owen blowing me a kiss. I also like the dog with I (heart) U ANNA written on its stomach. 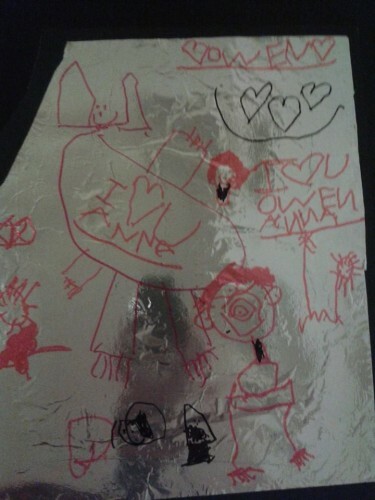 And here is the family portrait he drew, unprompted, at daycare. The things that look like rosy cheeks? They’re dimples. Love your insightful blogs, Anna. So much fun to read.